Diffusors are used to treat sound imperfections in rooms such as echoes and are an excellent complement to sound absorption because they do not remove sound energy. In this video we’ll examine How Diffusion Works. Diffusion is often a misunderstood concept, so first let’s take a look at the general definition and one more audio related. Diffusion: In general, the movement of a substance from an area of high concentration to an area of low concentration. Diffusion: In audio, the scattering of sound waves, reducing the sense of localization. Those two definitions may seem very different, but are actually quite similar. Let’s take a series of sound waves and bounce them off a wall. The initial waves are concentrated and move in the same direction at the same time. The sound waves reflected from the wall will come back to the listener at approximately the same time and from approximately the same direction. If a diffusor is placed on the wall and those same sound waves are generated, what happens? Most people assume the sound waves will be scattered in other directions rather than the directly reflected path. While this is true, it’s not the whole story. A good diffusor not only reflects waves in different directions, but does so EVENLY in all directions. Splitting a wave to go into two directions isn’t enough. Diffusors will split the sound waves into multiple random, even paths. A proper diffusor also impacts the time domain. If a sound wave is reflected into multiple directions evenly, the length of time the various waves require to reach the listener also changes. And in the world of sound, distance is time. And by scattering sound, the reflected waves take different paths which will have varying intensities. These reflected waves are less intense than the sound coming from the speaker. So with diffusion, you’re changing three domains of a sound wave – time, direction, and intensity. This makes it much more difficult for our ears and brain to determine exactly where the sound is coming from. And by reducing localization, diffusion tricks the brain into thinking the room is larger than what it is and yields a more spacious sound. Pretty clever stuff. So how do you go about obtaining proper diffusion? There are many myths about ‘home brew’ diffusion, and most work very poorly or not at all. Let’s take a look at one homemade remedy – a bookcase with books set at randomly varying depths. First of all books (if anything) will be more absorptive than reflective. Second, random depths of books on a shelf do not generate even, random reflections. The width, height, spacing, and pattern of the wells of a diffusor are carefully calculated to make sure they generate a smooth and even scattering of the waves over a 180 degree angle. Third, without this calculated spacing, reflected sound waves will interfere with direct sound which can create comb filtering. In effect you’re likely to get very little of the benefit of a professional diffusor while creating more issues in the frequency response. Overall, the best way to obtain proper diffusion is not through a home remedy but to utilize carefully calculated and professionally manufactured diffusors. 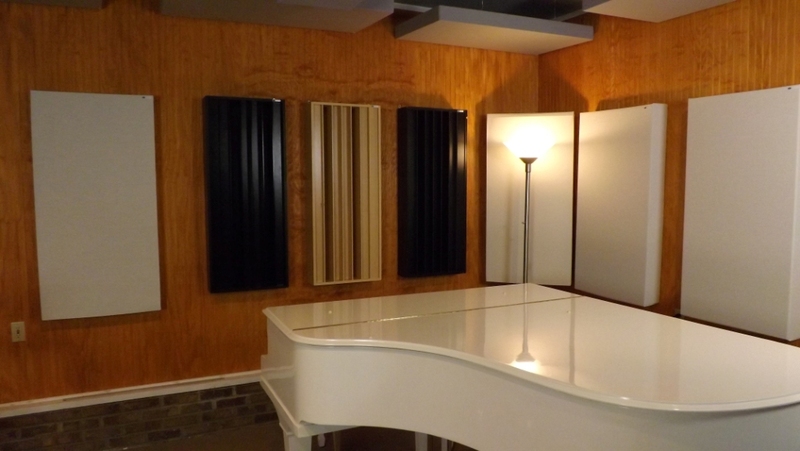 We invite you to contact GIK Acoustics so we may help you with the proper product selection and placement for your space. This entry was posted in Educational Videos, Videos and tagged comb filtering, diffusion, diffusors, room setup.